I’ve been swigging apple cider vinegar every morning for the past couple of years. I love it and it’s become my morning ritual, but when I was recently asked exactly what it does for the bod I had an incomplete answer. Unacceptable for me…so NOW here’s the full answer to why YOU may wanna add this mouth watering (or should I say mouth puckering) liquid to your daily regime! ACV produces cleansing properties in the bod that are known to aid digestion by stimulating the flow of enzymes and saliva in the mouth. Vinegar has been shown to support a healthy heart, but instead of making you read the benefits full out, let me list ’em for you! It is easy to incorporate vinegar into your daily diet. 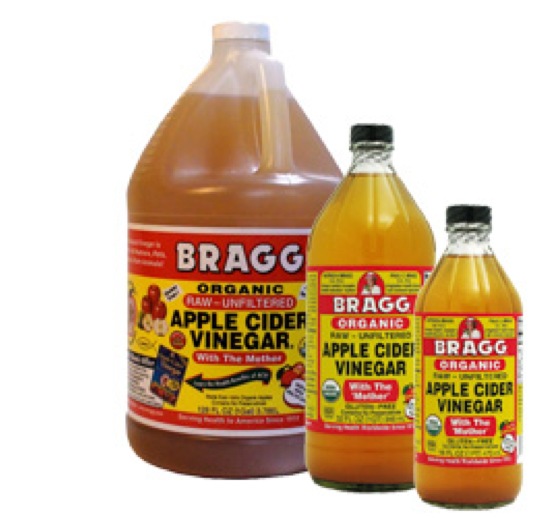 When you wake up each morning you can make a ACV cocktail using 2 teaspoons of raw, organic apple cider vinegar mixed in with approximately 8 oz of distilled water. If you need a sweetener, use organic honey, 100% maple syrup, or molasses to taste (if you’re watching your sugar or are diabetic, use the sweet substitute stevia). I have to admit I don’t mix it with water or honey, I take a swig right from the bottle. It can be harsh, but I love the way it starts (and ends) my day! I recommend starting with the ACV/water solution to start. Check it out and post below to let me know how it’s going! Happy Memorial Day! AND Remember, moderation is the key today when you’re chillin’ by the BBQ! This entry was posted in FIERCE HEALTH, FIERCE- ISH and tagged artificial sweeteners, balance, body, committment, fitness, food, mindful eating, nutrition, strength, weight-loss by GETFIERCE TRAINING. Bookmark the permalink.